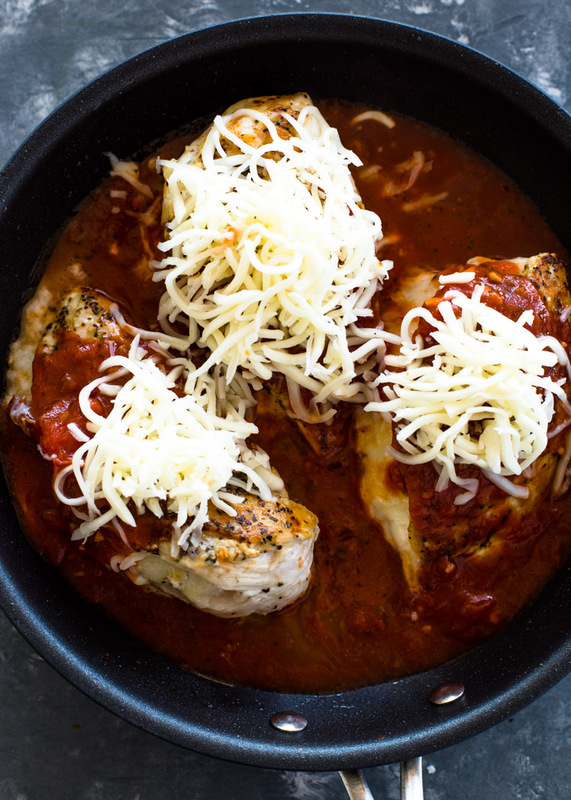 Juicy Cheese stuffed chicken breasts seared in olive oil and topped with marinara sauce and a mixture of parmesan and mozzarella cheese. 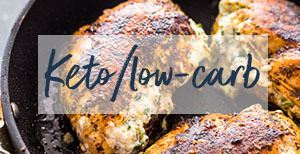 This delicious keto friendly stuffed parmesan chicken is healthier, filling and only 4 net carbs per serving! 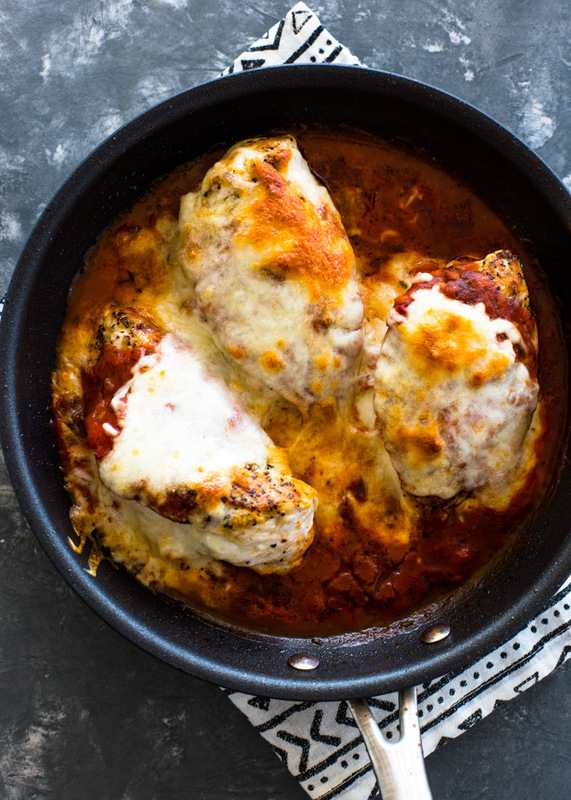 If your craving a warm and satisfying dinner that will not comprise the integrity of your keto diet, then I’ve got you covered with his delicious keto chicken parmesan. 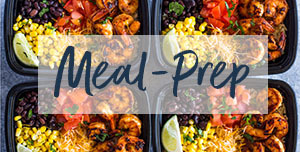 It’s loaded with delicious Italian flavors and will be sure to become a regular at your weekly dinner rotation. We love it so much that even when I’m not doing keto, this is the only way I’ll have my chicken parmesan just because it’s so much healthier with no breading or frying needed. The chicken is simply seasoned with salt & pepper, Italian seasoning, stuffed with cheese, and pan seared in olive oil. It is then topped with marinara sauce and more cheese and baked until tender. Season the chicken generously on both sides. 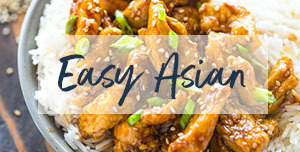 Hold down the chicken breast and slide a sharp knife about three-quarters of the way through the chicken breast without slicing through the other side. stuff the chicken breasts and seal with toothpicks or a kabob skewer to contain the filling. 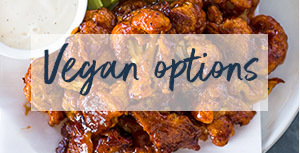 The first step is to start with small-medium chicken breasts. The rule of thumb for us is the smaller the chicken breasts the better and most likely then healthier they’ll be. Generously season the chicken breasts on both sides and slice through to form a small pocket for the cheese. 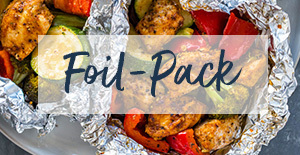 Stuff the chicken breasts with cheese and seal with hands, toothpicks or kabob skewers. If you’re too lazy (like me) like or don’t have toothpicks or kabob skewers on hand, simply place the cheese in the chicken and press the edges gently to seal it with your hand. Some of the cheese might drip out of the chicken while baking but it will still taste amazing! The next step is to pan sear the chicken breasts until they are golden and the edges are crispy. The step will give the chicken a beautiful crust and will add lots of flavor to the dish. If you’d like to go the extra step. Add 3-4 cloves of finely chopped garlic to the pan (toss them in right next to the chicken) about 30 seconds before adding the marinara sauce. The last and final step is to top the chicken with marinara sauce and more cheese and bake for 15 to 20 minutes (depending on the size of your chicken). 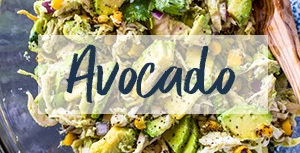 Enjoy this low carb chicken parm with a side of arugula, avocado, your favorite chopped salad, zucchini pasta, or steamed veggies. 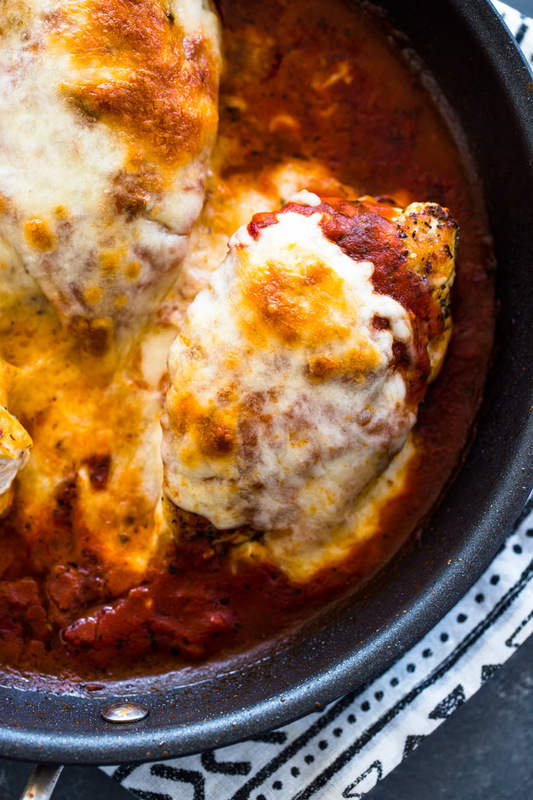 Juicy Cheese stuffed chicken breasts seared in olive oil and topped with marinara sauce and a mixture of parmesan and mozzarella cheese. This delicious keto friendly stuffed parmesan chicken is healthier, filling and only 4 net carbs per serving! Preheat oven to 375 degrees. Combine mozzarella and parmesan cheese in a small bowl and set aside. Use a sharp knife to cut a pocket into the side of each chicken breast. Generously season both sides of the chicken breasts with Italian seasoning, garlic powder, and salt & pepper. 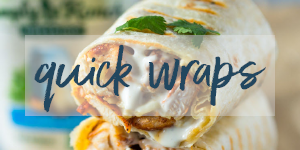 Stuff about ¼ cup of cheese into each chicken breasts and fold or seal with toothpicks if available. Heat 1 tablespoons olive oil in a large heavy-duty pan over medium-high heat. Add the chicken breasts to the pan and sear for 3-4 minutes per side or until golden. Remove from heat and spoon sauce on chicken breasts. 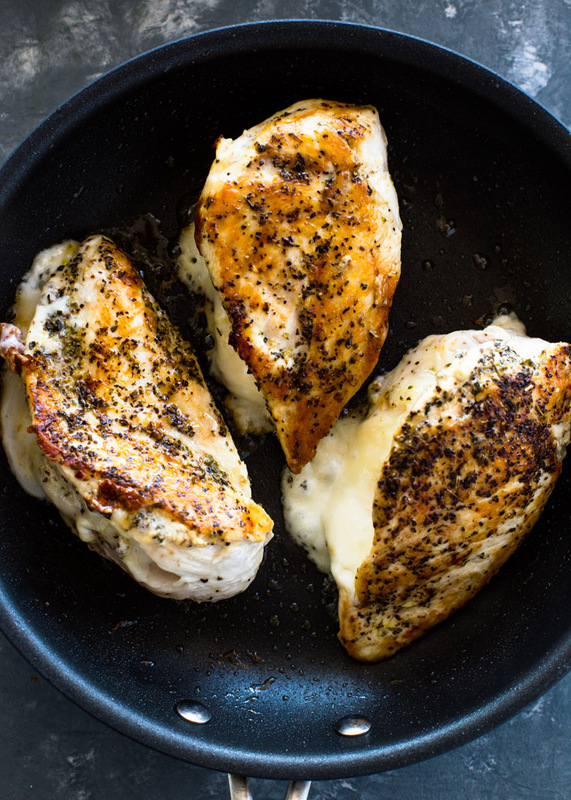 Top each chicken breast with a few tablespoons of cheese and bake uncovered at 375˚F for 15-20 min, or until an instant-read thermometer reads 165˚F. 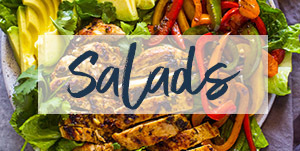 Serve immediately with a chopped salad, steam veggies or zucchini noodles. 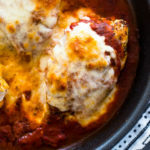 To make unstuffed: If you are not comfortable stuffed chicken breasts or to make the chicken parm unstuffed, simply slice the chicken breasts in half and pan sear (without stuffing) then top with marinara sauce and cheese. To add more garlic flavor: Toss 3-4 cloves of chopped garlic into the pan 30 seconds before adding the marinara sauce.